In the early First Era, Elsweyr was known to consist of sixteen independent realms that cooperated with each other for their mutual protection and economic benefit. Ne Quin-al was famed for its great warriors and Temple of Two-Moons Dance. Traditionally, the city-states of Elsweyr shared power based on the lunar phases of Masser and Secunda, and Ne Quin-al's influence was said to be at its height when both moons were full. By 1E 461, Ne Quin-al was ruled by the legendary Darloc Brae, the Golden Beast of Anequina. Darloc Brae's reign was considered glorious by the Khajiit, as he led the Anequine Conquests and expanded his kingdom's territory to its greatest extent, from as far west as Arenthia to as far east as Rimmen. The devastating Thrassian Plague of 1E 2260 proved particularly disruptive to Elsweyr's delicate political balance, and when it subsided the original sixteen realms had consolidated into two survivors: Pa'alatiin and Ne Quin-al, or Pellitine and Anequina as they were known in Cyrodilic. The two kingdoms fell into a bitter, often violent feud that stalemated for centuries; Anequina had developed a disciplined warrior culture, but Pellitine had wealth enough to hire mercenaries. The feud finally ended in 2E 309, as the kingdoms' rulers, Keirgo of Anequina and Eshita of Pellitine, married and united their realms into the Elsweyr Confederacy. This move was initially deeply unpopular among the tribes of Anequina, who felt that their nobility had betrayed them, and they rebelled and besieged Anequina's cities. After the Second Empire ignored Keirgo's pleas for aid, Mane Rid-Thar-ri'Datta quelled the unrest by instituting another moon-based power-sharing system between the tribes and the nobility. In the late Third Era, Anequina lent its name to the "Heart of Anequina", a pivotal battle of the Five Year War between Elsweyr and Valenwood in which the Khajiit triumphed. The Khajiit artist Cherim, a veteran of the conflict, created an elaborate tapestry that depicted the battle. In 4E 115, the Thalmor backed a coup that dissolved the Elsweyr Confederacy. In its place, the kingdoms of Anequina and Pelletine were reestablished and made client states of the third Aldmeri Dominion. 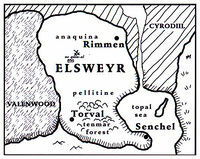 The work of historical fiction, 2920, Sun's Dawn, asserts that the kingdom occupied the south of the province around Senchal, which is clearly wrong. ^ Loading screens in ESO. This page was last modified on 13 January 2019, at 03:51.